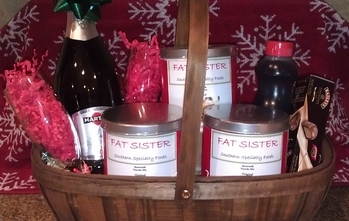 At FAT SISTER, we specialize in creating authentic southern specialty foods. 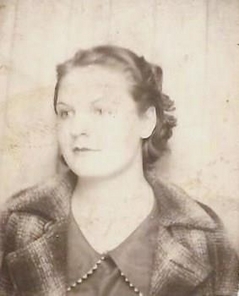 Our foods are inspired by family recipes that have been passed down for generations. We believe that good food brings families and friends together and some of our favorite memories are those of time spent with our family in the kitchen. So grab some FAT SISTER, some friends and family, and get cookin'!!! Created in the heart of a true southern kitchen, FAT SISTER offers specialty pancake mixes so that you can make authentic southern buttermilk pancakes at home. We promise that once you try one of our pancakes that you will never want any other pancake mix again! FAT SISTER pancakes are thick and buttery and, unlike other mixes that use powdered buttermilk substitutes, our pancakes are made with natural ingredients and call for real buttermilk. These pancakes have been enjoyed by friends and family for generations. Many would drive out of their way to our Nana's house just to enjoy her fabulous pancake breakfasts and to this day pancake breakfasts remain a family favorite tradition. Our love for cooking and these special memories and traditions inspired us to create a product so that every family can enjoy them right in their own kitchen! Below is a list of our current flavors. Order now and start creating traditions and memories of your own! Our original pancake mix is the original FAT SISTER pancake recipe! Thick and buttery, this pancake is an authentic southern buttermilk pancake. Just like our Nana used to make! 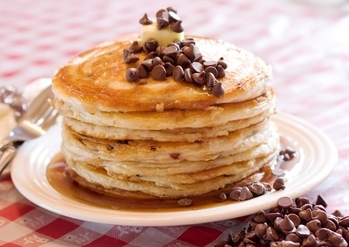 Our chocolate chip pancake mix speaks for itself. Its our original pancake mix with half a cup of real chocolate chips! Dessert and breakfast all rolled into one! YUMMY! 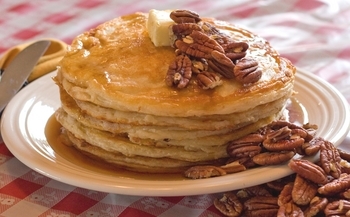 Our Butter Pecan pancake mix is a true southern specialty! Made with real pecans, this pancake has just the right combination of of rich buttery texture with a surprising pecan crunch. 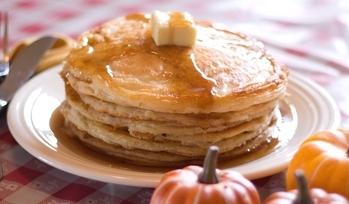 Our Pumpkin Spice pancake mix is a delightful combination of butter and special pumpkin spices. You don't need a holiday to enjoy this special pancake mix. Our Peanut Butter pancake mix will make you weak in the knees! This specialty mix contains just the right amount of real pieces of peanut butter making each bite melt in your mouth. Don't miss out on the craze. Our sampler packs allow you to try a variety of our mixes. Aren't crazy about a particular flavor? That's ok, mix and match any combination of mixes! 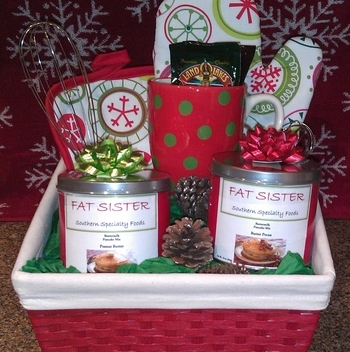 We offer a variety of gourmet gift baskets filled with our Fat Sister Pancake Mixes and other goodies. Perfect for the holidays, corporate gifts or even a wedding gift! 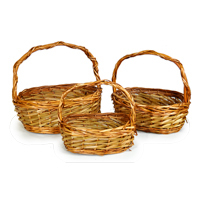 We offer pre-made baskets as well as custom baskets. Check out our selection below. 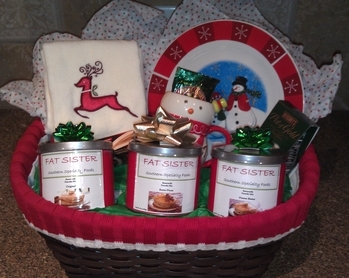 Please contact us to inquire further or to make an order for a gourmet Fat Sister gift basket! This basket makes a perfect gift for a friend, family member or even work associate. It includes 3 of our specialty pancake mixes as well as lots of other Christmas goodies: an embroidered handtowel, ceramic holiday plate, coffee mug, hot chocolate mix and specialty chocolates. This basket is a fabulous gourmet treat. It includes 3 of our specialty pancake mixes, a bottle of champagne, two champagne flutes, a bottle of syrup and some specialty chocolates. This basket is a perfect weekend accessory. It comes with 2 of our specialty pancake mixes, a coffee mug, gourmet hot chocolate, and decorative oven mits. A perfect gift for anyone! This no-fuss basket makes the perfect gift for someone who just loves pancakes. 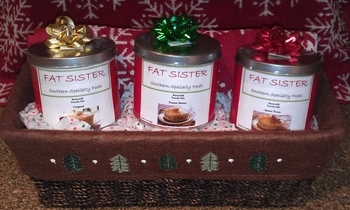 3 of our specialty pancake mixes are packaged nicely in a decorative basket with a holiday dish towel. A real southerner knows to use real buttermilk in a pancake! Other pancake mixes include buttermilk substitutes or buttermilk powder and ask you to add water or milk. We would never ask you to add water or milk to create a true buttermilk pancake! 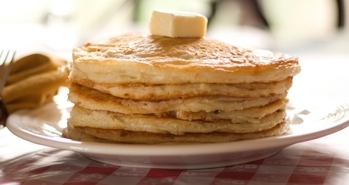 The secret to the amazing taste of our pancakes is our specialty ingredients and the use of real buttermilk. The rich creamy taste and texture of buttermilk is essential to creating the perfect authentic buttermilk pancake. In addition to creating a perfect pancake, buttermilk also has many health benefits! Is probiotic - it includes good bacteria that promotes healthy digestion and strenghtens your immune system. 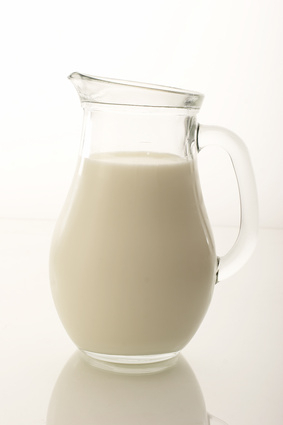 Is high in potassium, vitamin B12, calcium and riboflavin and is a good source of phosphorus. And let's not forget the yummy taste! Cooking Tips: for tips on how to create the perfect pancake, please visit our "Cooking Tips" tab. 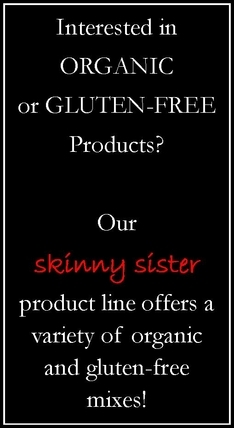 Copyright © 2011 Fat Sister LLC. All Rights Reserved.